Monoprint on paper. 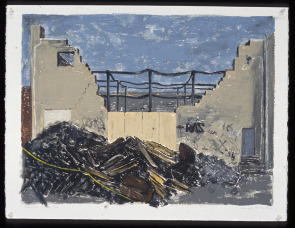 Artist's caption: "The remains of the Morris Schiff fire were left blocking the sidewalk on American Street for many years. The site is now occupied by the row of newer houses next to the Liberty Lands playground."